Atlantic County is a county located in the U.S. state of New Jersey. As of the 2010 United States Census, the county had a population of 274,549, having increased by 21,997 from the 252,552 counted at the 2000 Census (+8.7%, tied for third-fastest in the state), retaining its position as the 15th-most populous county in the state. As of the 2016 Census estimate, the county's population was 270,991, making it the state's 15th-largest county. Its county seat is Mays Landing. The most populous place was Egg Harbor Township, with 43,323 residents at the time of the 2010 Census, while Galloway Township, covered 115.21 square miles (298.4 km2), the largest total area of any municipality, though Hamilton Township has the largest land area, covering 111.13 square miles (287.8 km2). This county forms the Atlantic City–Hammonton Metropolitan Statistical Area, which is also part of the Delaware Valley Combined Statistical Area. All of what is known today as Atlantic County was once called Egg Harbor Township, the eastern half of the original County of Gloucester. Named as an official district as early as 1693, it was bounded on the north by the Little Egg Harbor River (now known as the Mullica River), and on the south by the Great Egg Harbor River and its southern branch the Tuckahoe River. Its eastern boundary was the Atlantic Ocean, but the western boundary in the South Jersey interior was not fixed until 1761. 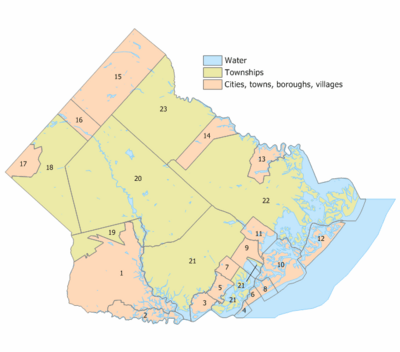 The county was formally created from portions of Gloucester County as of February 7, 1837, and consisted of the townships of Egg Harbor, Galloway, Hamilton and Weymouth. According to the 2010 Census, the county had a total area of 671.83 square miles (1,740.0 km2), including 555.70 square miles (1,439.3 km2) of land (82.7%) and 116.12 square miles (300.7 km2) of water (17.3%). Atlantic County is located in the Atlantic Coastal Plain in the southeastern part of New Jersey. Topographically, much of Atlantic County is low-lying and flat. The highest elevation, approximately 150 feet (46 m) above sea level, is found at two areas next to the New Jersey Transit passenger rail line just west of Hammonton. Sea level is the lowest point. As of the census of 2010, there were 274,549 people, 102,847 households, and 68,702 families residing in the county. The population density was 494.1 per square mile (190.8/km2). There were 126,647 housing units at an average density of 227.9 per square mile (88.0/km2)*. The racial makeup of the county was 65.40% (179,566) White, 16.08% (44,138) Black or African American, 0.38% (1,050) Native American, 7.50% (20,595) Asian, 0.03% (92) Pacific Islander, 7.36% (20,218) from other races, and 3.24% (8,890) from two or more races. [[Hispanic (U.S. Census)|Hispanic or Latino of any race were 16.84% (46,241) of the population. There were 102,847 households out of which 29.8% had children under the age of 18 living with them, 45.6% were married couples living together, 15.5% had a female householder with no husband present, and 33.2% were non-families. 26.9% of all households were made up of individuals, and 10.8% had someone living alone who was 65 years of age or older. The average household size was 2.61 and the average family size was 3.17. In the county, the population was spread out with 23.3% under the age of 18, 9.3% from 18 to 24, 24.6% from 25 to 44, 28.7% from 45 to 64, and 14.2% who were 65 years of age or older. The median age was 39.9 years. For every 100 females there were 94.2 males. For every 100 females ages 18 and old there were 91 males. As of the 2000 United States Census there were 252,552 people, 95,024 households, and 63,190 families residing in the county. The population density was 450 people per square mile (174/km²). There were 114,090 housing units at an average density of 203 per square mile (79/km²). The racial makeup of the county was 68.36% White, 17.63% Black or African American, 0.26% Native American, 5.06% Asian, 0.05% Pacific Islander, 6.06% from other races, and 2.58% from two or more races. 12.17% of the population were Hispanic or Latino of any race. Among those residents listing their ancestry, 18.3% were of Italian, 17.3% Irish, 13.8% German and 7.7% English ancestry according to Census 2000. There were 95,024 households out of which 31.70% had children under the age of 18 living with them, 46.50% were married couples living together, 14.80% had a female householder with no husband present, and 33.50% were non-families. 27.00% of all households were made up of individuals and 10.70% had someone living alone who was 65 years of age or older. The average household size was 2.59 and the average family size was 3.16. In the county, the population was spread out with 25.30% under the age of 18, 8.10% from 18 to 24, 30.60% from 25 to 44, 22.40% from 45 to 64, and 13.60% who were 65 years of age or older. The median age was 37 years. For every 100 females there were 93.60 males. For every 100 females age 18 and over, there were 90.20 males. The median income for a household in the county was $43,933, and the median income for a family was $51,710. Males had a median income of $36,397 versus $28,059 for females. The per capita income for the county was $21,034. About 7.6% of families and 10.50% of the population were below the poverty line, including 12.8% of those under age 18 and 10.50% of those age 65 or over. As of 2010[update], the county had a total of 1,930.77 miles (3,107.27 km) of roadways, of which 1,357.05 miles (2,183.96 km) were maintained by the local municipality, 372.63 miles (599.69 km) by Atlantic County and 143.50 miles (230.94 km) by the New Jersey Department of Transportation and 57.59 miles (92.68 km) by either the New Jersey Turnpike Authority or South Jersey Transportation Authority. Major roadways include the Garden State Parkway (with 21.5 miles (34.6 km) of roadway in the county), the Atlantic City Expressway (29.6 miles (47.6 km)), U.S. Route 9, U.S. Route 30, U.S. Route 40, U.S. Route 206 and U.S. Route 322, as well as Route 49, Route 50, Route 52, Route 54, Route 87 and Route 152. New Jersey Transit's Atlantic City Line connects the Atlantic City Rail Terminal in Atlantic City with the 30th Street Station in Philadelphia, with service at intermediate stations at Hammonton, Egg Harbor City and Absecon in the county. In recent years, average temperatures in the county seat of Mays Landing have ranged from a low of 24 °F (−4 °C) in January to a high of 86 °F (30 °C) in July, although a record low of −11 °F (−24 °C) was recorded in February 1979 and a record high of 106 °F (41 °C) was recorded in June 1969. Average monthly precipitation ranged from 2.99 inches (76 mm) in February to 4.21 inches (107 mm) in March. Atlantic County, New Jersey Facts for Kids. Kiddle Encyclopedia.